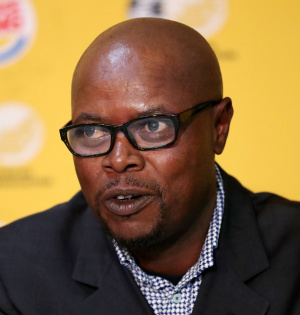 Phil Masinga (born Philemon Raul Masinga; 28 June 1969 – 13 January 2019) was a South African professional footballer and manager who played as a striker from 1990 to 2002. His career peaked at Mamelodi Sundowns Football Club where he made 108 appearances and scored 98 goals, averaging 0,9 goals per match, a feat has never been repeated or surpass in South Africa. On 16 August 1997 in a match against Congo, Phil Masinga scored from 25 meters out - the only goal of that match - to secure South Africa's passage to the 1998 Fifa World Cup in France. Phil Masinga died on 13 January 2019 after he had been admitted to hospital the previous month, due to cancer. This page was last edited on 29 January 2019, at 22:21.